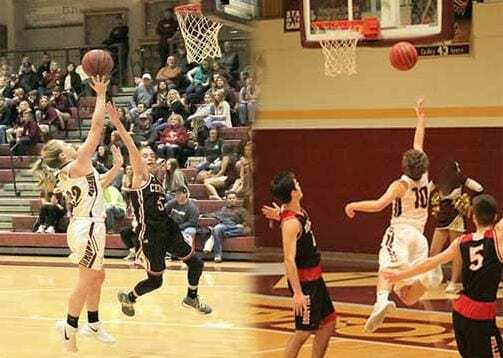 DAWSON, GA – Saturday, Jan 6, the Dawson County Lady Tigers (9-7, 1-3 Region 7-AAA) hosted the Forsyth Central Lady Bulldogs (7-9, 0-2 Region 5-AAAAAAA) and although this was a non-region contest, the ladies from Dawson County showed up ready to play. This was the second time this season that these to programs met on the hardwood, as Dawson’s varsity girls took a 19-pt victory on the Lady Bulldog’s court on Dec 16. Not taking their second meeting for granted, Dawson County started the game strong and finished in the same manner, leaving no doubt that the best team won Saturday afternoon. The final margin? A whopping 30 points, the biggest loss served to the Lady Bulldogs this season! Final score: 66-36. With a dominating 30-pt victory and more than 60-pts on the scoreboard, the Lady Tigers clearly know how to shoot a basketball. Leading the scoring for the Lady Tigers in her first game back from injury was Kaylee Sticker – with 19 points (including four 3 pointers). She was followed by Sophia d’Oliveria with 10 points, respectively. Dawson County head coach Steve Sweat also had plenty to be proud of in the effort of his girls on the defensive side of the basketball, providing a balanced performance of defensive pressure and accurate shooting offensively. The Lady Tigers will be at home on Tuesday hosting Union County (11-4, 3-1) in what should be an exciting game for Region 7-AAA. The Lady Panthers are coming off a four game win streak and currently sit tied for second overall in the region (with North Hall). Tip-off is scheduled for 6pm and you won’t want to miss this one. Union County has a reputation for traveling well, so if you’re a fan of your Tigers you’ll want to make it a point to get to the game early and cheer for your varsity girls and boys! On the boys side, the Tigers (12-4 overall, 4-0 Region 7-AAA) took a tough loss to a strong Forsyth Central Bulldogs team 63-57 in overtime. This was the second consecutive night the Tigers forced overtime against a strong team. Just one night prior to this matchup, the Tigers took the victory over East Hall in Gainesville, 94-91. Though head coach Chad Pittman was proud of the effort of his team in this game, the Tigers unfortunately did not appear to have the energy to hold off the Bulldogs in the overtime period. They fought hard and played well, and despite the loss they showed everyone in attendance why they are the team to beat in Region 7-AAA. Dawson County was led in scoring by Jeremiah Crumley with 25, followed by Cullen Reed with 22 and Campbell Reed with 7. The Tigers will hit the hardwoods again Tuesday night at 7:30 when they host Union County (13-2, 3-1), who’s only region loss came by the hands of East Hall (77-61) on Jan 3.